As Cushing supplies decline due to increased logistic options out of the storage hub in the Midwest PADD 2 in Cushing, Oklahoma inventories are rising to elevated levels in the Gulf Coast which eventually will provide the bottleneck and back up oil flows all along the supply and logistics chain. The shortsighted obsession of building and expanding pipelines out of Cushing, just to store it on the gulf coast serves as an important reminder to look at problems more broadly, without an aggressive oil export market (even with increased refinery capacity for petroleum products along the Gulf Coast) there is just too much domestic and North American Oil with no place and market destination to soak up this extra production. One doesn`t just all the sudden start pumping over 8 million barrels of oil a day and drastically reducing foreign imports without providing unintended consequences for supplies which have been elevated for years in the United States currently standing at over 380 million barrels and climbing with over 200 million alone being stored along the Gulf Coast in PADD 3. The geniuses in the oil market thought all they had to do was build more pipelines out of Cushing Oklahoma and the glut of domestic oil was solved, not really taking into account the demand fundamentals of supply and demand. Just moving oil from one bottleneck to another bottleneck a few states over doesn`t address the core problems of oversupply and lack of economic demand to soak up additional supply globally with weak emerging markets and increased fuel efficiency standards and changing driving patterns in the US its strongest market. At what point does the bottleneck along the Gulf Coast just back all the way back to Cushing, Oklahoma again? Thus completely mitigating all the capital and resources spent on increasing pipeline capacity out of the energy hub where even with the recent declines are still above their five year historical averages. How much oil are we going to store in this country? 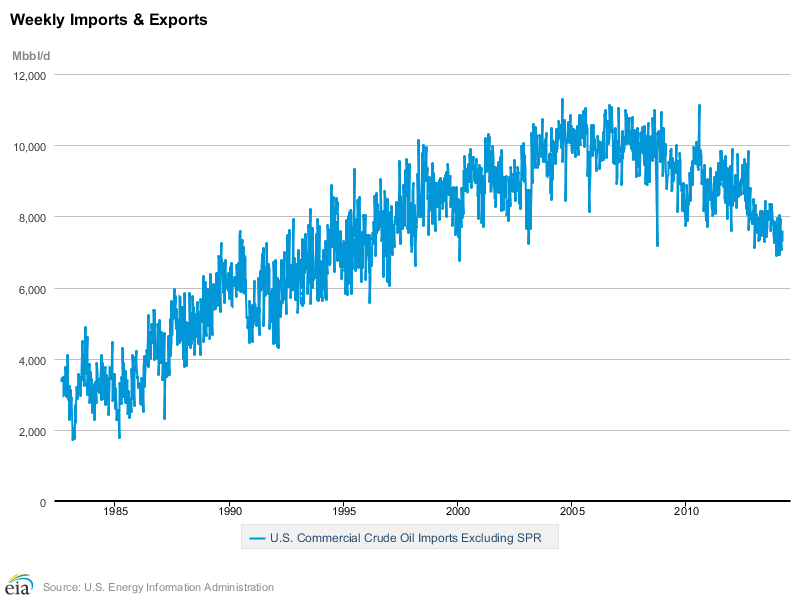 It is obvious that supply is more than demand and the reason that despite a huge reduction in imports in the largest market for demand oil supplies are near record levels in the United States. 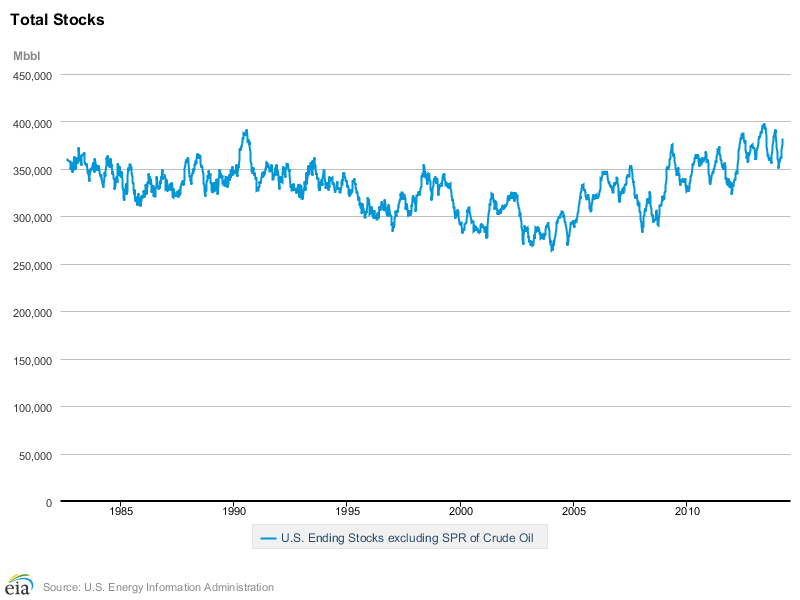 Another question is what does the WTI contract represent? 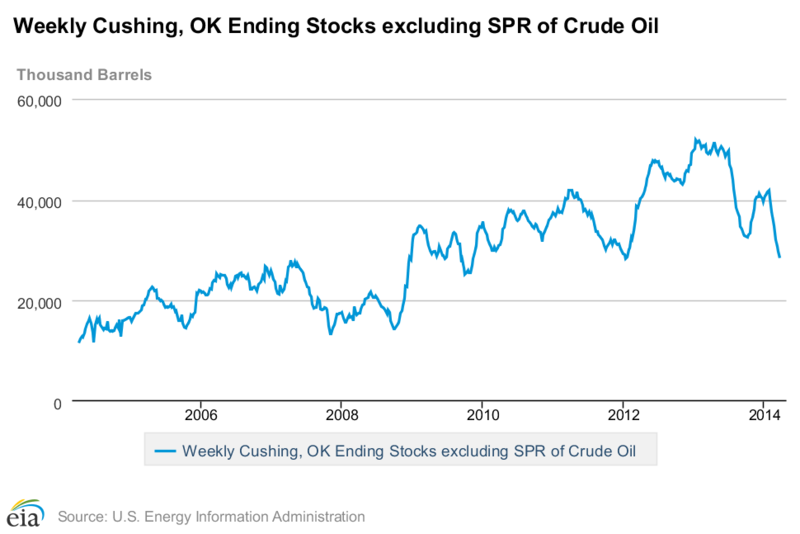 Does it strictly represent Cushing Oil or is it a proxy for domestic US Oil? Does it really matter if you move Oil two states over from one storage hub to another? 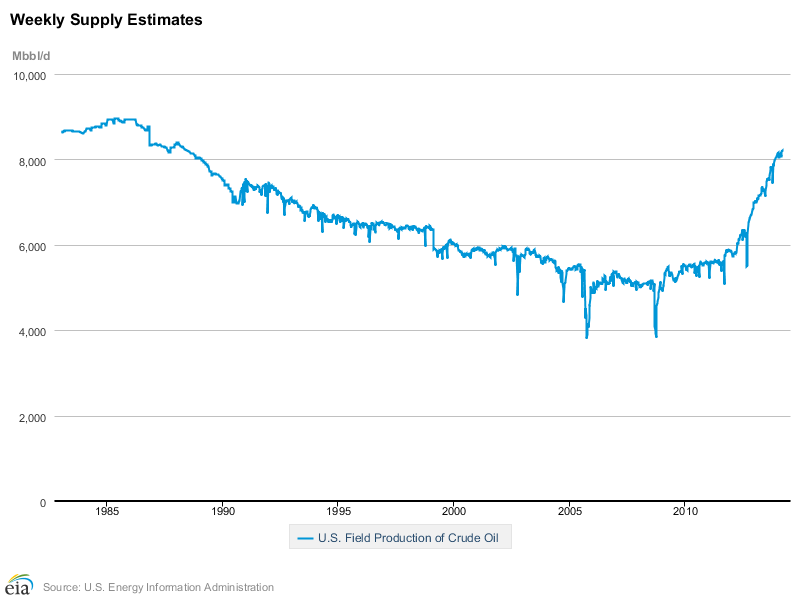 Have you really solved the glut of US Oil supplies? It is not like anyone actually takes delivery of the WTI Cushing based contract in a well-supplied energy market, less than one percent of one percent of oil traded takes physical delivery. This shell game of moving oil from one PADD 2 storage hub to another PADD 3 storage hub doesn`t address the core problem and the rise in PADD 3 Oil supplies makes this abundantly clear. There is just too damn much oil stuck in the United States with no real market for it to go to given the unprecedented increases in North American and US domestic Oil production of the last three years. 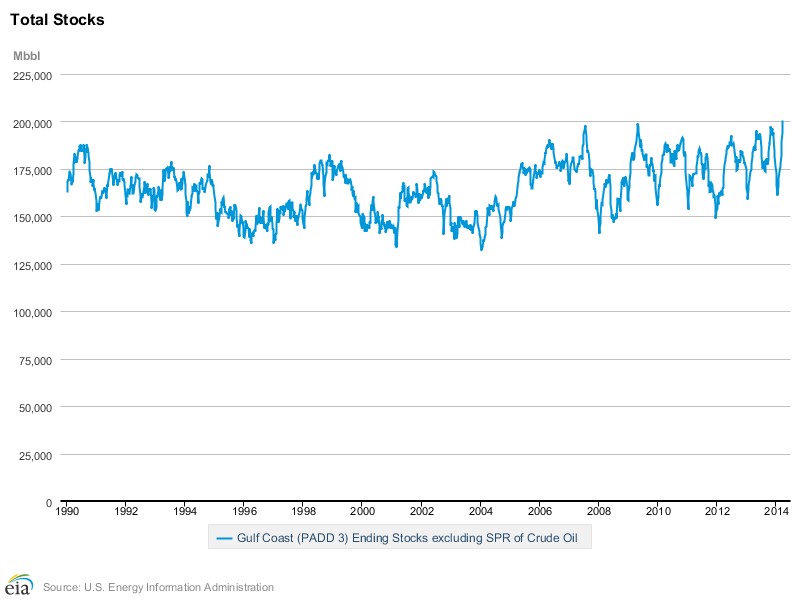 This is the big picture issue that still needs to be resolved in the oil energy space and just increasing refinery capacity along the Gulf Coast isn`t enough to solve this supply glut as the rising PADD 3 inventories point out in the latest EIA reports.